Your order shipped Free! Receive free shipping with $69 orders. Orders under $69 have a low Flat Rate $6.95 shipping fee. 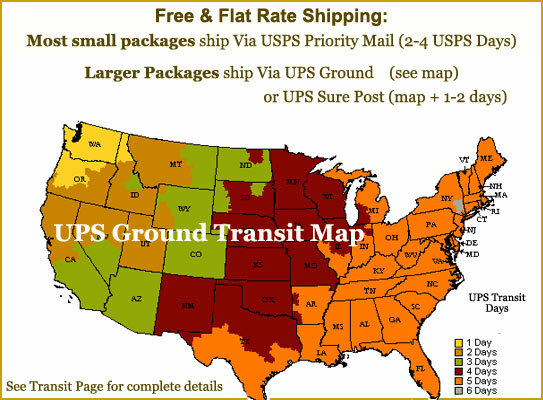 Free and Flat Rate shipping are valid on ground street address shipments to one location within the contiguous 48 states (does not apply to APO / FPO addresses). We will ship to a PO Box if packed weight is under two lbs, or if the items ordered will fit selected Flat Rate USPS packages. Free and Flat rate thresholds are calculated after all discounts are applied to the order total. Click here for transit times and more detailed shipping information. In order to facilitate your shipments, we may choose the carrier of our choice (in the same class of service). ♦ Please verify your shipping address for accuracy. Free and Flat rate shipping will not apply to abandoned, refused and un-delivered packages; Actual shipping charges both ways plus any additional handling charges by UPS will be assessed.